New Zealanders Shihad have dropped a bomb with album number nine, FVEY, a bristling, shouting, angry, heavy, dark slab of rock’n’ roll that threatens to destroy all in its path. Lead guitarist, Phil Knight, speaks to SHANE PINNEGAR in the lead up to their show at the Rosemount Hotel, Saturday November 1. There’s nothing light or ‘pop’ about Shihad’s mighty new album: from the title on down they’re tackling some weighty issues head on. “Well, it’s called FVEY,” he says, “it’s actually an acronym for The Five Eyes, which is an intelligence-gathering alliance between five countries – Australia, New Zealand, Canada, UK and the US. They abbreviate FVEY, Five Eyes. I would say Five Eye. Knight says that some of the lyrics on FVEY were influenced by singer, Jon Toogood, marrying his partner Dana in her homeland of the Sudan midway through recording the album. Touted as their most uncompromising album since their debut, Churn, recorded a surprising 20 years ago, FVEY sees the band working with producer Jaz Coleman (Killing Joke) for the first time in those two decades. Was he the same kind of guy to work with all those years later? “In some ways, but in some ways not,” Knight says. “He was 20 years younger then! He was still drinking and stuff back then – he gave up drinking 10 years ago. So did I, we sort of clicked on that, we’re sort of simpatico on that level. We both sort of mellowed out a little bit. Both have been easier to work with. But he’s still the same passionate, opinionated sort of old punk rocker guy that we worked with back in ’93. “He’s just been an amazing energy to be around, very energetic with what he brings to the mix as a producer and an orchestrator. He’s got this whole punk rock thing where he also knows how to… he was standing in the middle of the room sort of conducting us as we were playing,” the guitarist laughs. 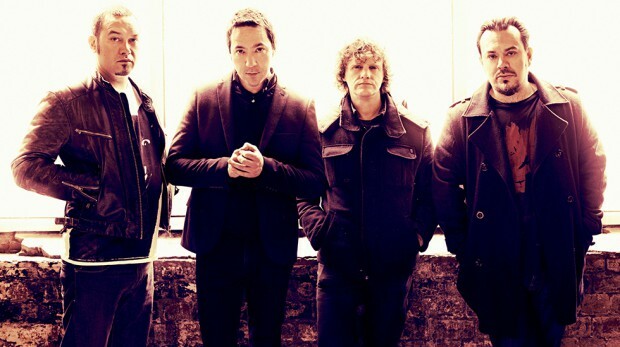 Live is where Shihad have always excelled, and they’ll be touring the album around the country in October-November. Knight feels like they’ve captured the band’s live essence on FVEY.